Kings and emperors like to have their little hobbies to pass the time when they are not fulfilling their tiresome duties. Louis XVI of France (1754-1793) had his hunting and his metalwork, both of which proved useful in keeping his mind off the mob baying at his gates when the French Revolution broke over his head, the head which that same mob would eventually slice off not too long afterwards. Emperor Franz II/I of Austria (1768-1835) was a passionate collector: in his childhood it was plants and flowers, in his adulthood expensive books. He was also good with his hands: he himself built the cage for the two pet goldfinches that filled his office with song. His uncle Emperor Joseph II (1741-1790) – well, he collected whatever scraps of knowledge came his way. He thought he knew about everything, whether from farming to high finance, better than any farmer or financier. He was so knowledgeable that by the end of his ten-year reign he had single-handedly brought the Holy Roman Empire to the brink of collapse. Fortunately, he was followed by his younger brother, Leopold II (1747-1792) who was able in the two years he had on the throne to rescue the dire situation that Joseph had left. Archduke Peter Leopold, as he was titled before taking the throne, was a spirited scientific experimentalist who was passionately interested in science and technology. In this charming portrait we see the 15 year-old prince designing fortifications. In our own times he would be the boy with the modular construction kits, the one-chip computer and the chemistry set. 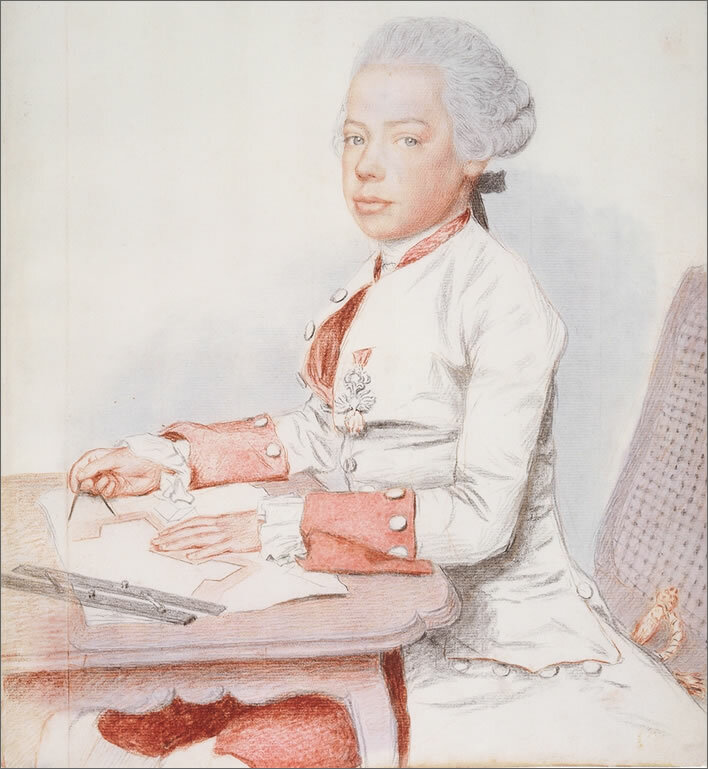 An aquarell by Jean-Etienne Liotard (1702-1789) of Archduke Peter Leopold, 15, designing the plan of a fortification (1762). A son of Empress Maria Theresia, who would himself be Emperor of the Holy Roman Empire between 1790 and 1792, can only do such things wearing a uniform, ceremonial dagger and the pendant of the Order of the Golden Fleece. Image: Cabinet d'arts graphiques des Musées d'art et d'histoire, Genève, Propriété de la Confédération Suisse, Fondation Gottfried Keller, Berne. 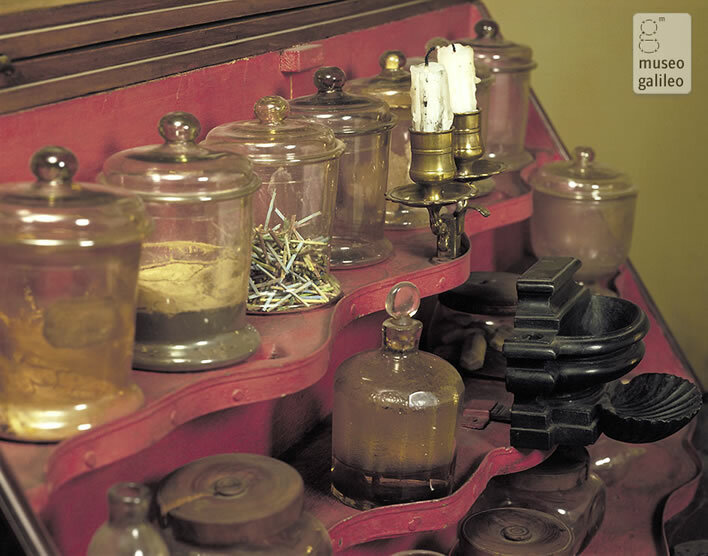 And indeed he did have a chemistry set, a remarkable chemistry cabinet that was built for him to his own design. It is an astonishing piece of cabinet making. Closed it looks like the base of a writing desk with a large box on top of it. The box in fact consists of several hinged panels that when opened expose a slate worktop surrounded by a complex arrangement of small drawers and shelves holding jars and bottles containing various substances. The cabinet is equipped with a burner complete with a foot-powered bellows and a wide range of equipment for the chemical experiments of the day. The design of it alone must have constituted quite a project for Leopold and its very complexity is evidence for the seriousness with which he took his hobby. Archduke Peter Leopold's chemistry cabinet, now in the Museo Galileo in Florence. Image©2010-2015 Museo Galileo – Institute and Museum of the History of Science. It is not clear when the cabinet was built, who built it or where it was located. Leopold is said to have donated the piece to the Imperial and Royal Museum of Physics and Natural History (Imperiale e Regio Museo di Fisica e Storia Naturale) in Florence when he left Florence for Vienna in 1790 to become emperor. His cabinet can be seen in what is now known as the Museo Galileo. In the intervening years the museum and its cabinet had some near-death experiences: damage from World War I; the disastrous flooding of Florence on 4th November 1966 in which the cabinet – unfortunately on the ground floor of the musuem – was seriously damaged and some pieces were lost; there was damage too from the Mafia's bomb attack on the Uffizi in 1993. Around a hundred people died in the floods of 1966 and an immense number of precious documents and works of art were damaged or destroyed; a further five people died in the Mafia bombing in 1993. We should therefore probably reserve our tears for other things than Leopold's chemistry cabinet. Some of the substances in the sealed bottles stored in the cabinet survived and have recently been analysed. From the analysis it seems clear that Leopold, sensibly enough, was not trying to make any breakthroughs in analytical chemistry, but was more interested in the substances and processes that were used in the manufacturing industry of the time in Tuscany. If this is the case it would also explain why Leopold left the cabinet behind in Florence when he left for Vienna to become Holy Roman Emperor in 1790 – the chemistry hobby was intimately a part of his Tuscan years and related to his government there. Although we have called chemistry somewhat disparagingly his 'hobby', it is clear that it had a serious purpose for him: how could it be other for such a serious personality as Leopold's? Furthermore, sweeping up the almighty mess his brother Joseph had left behind would leave him no time to work with his chemistry set. Some of the contents of Archduke Peter Leopold's chemistry cabinet. Note: if you go to see chemistry cabinet or download the images from the Museo Galileo be aware that a number of objects are placed with it that were not owned or used by Leopold: 'Also exhibited are objects from the Granducal period' as the museum puts it. In other words they are using Leopold's cabinet as a stand for whatever has come to hand from the period to save themselves an additional display cabinet. Not good. See the following image of a less cluttered display. Image©2010-2015 Museo Galileo – Institute and Museum of the History of Science. 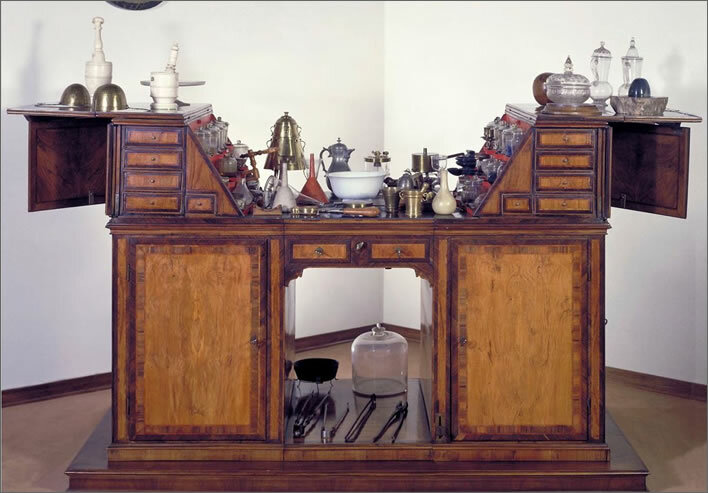 Archduke Peter Leopold's chemistry cabinet as it appeared in 1929, before it was damaged and then used as a display cabinet for unconnected items.– Institute and Museum of the History of Science. Of course, when we use terms such as 'chemistry' we overlook how far from ours the chemistry of Leopold's time is. He has no idea of atoms, elements or compounds. He has no modern notation for his substances and no idea of their inner composition. He is using symbols for them that derive from alchemy. Even the fundamental process of combustion/oxidation was masked at the time by the incorrect Phlogiston theory. Whereas today's chemist has shelves of pure compounds, Leopold had bottles containing, for example, the oil of parsley seeds, an oil made from squashed ants, alcohol (man's best friend down the ages), caraway seed oil, Olio di Dippel (source unknown) and celery seed oil. A large part of the solid substances in his collection are dyestuffs and the rest seem to be associated with Tuscan products and industries. The 18-year-old Leopold became Grand Duke of Tuscany in 1765 and was reportedly persuaded to give up his chemistry hobby before he did himself some damage with flames and vapours. The existence in Florence of his chemistry cabinet, which he didn't really dispense with until 1790, that is, another 25 years after officially renouncing his hobby, suggests that, safely out of the sight of his mother, who spied on the members of her own family without compunction, Leopold continued with his quest for knowledge in the spirit of the age. His cabinet folded up cunningly and no casual observer – servant, minister or visitor – would be able to guess what it held and carry report to his mother. Until 1770 he had to put up with the counsellors appointed by Maria Theresia to look after him looking over his shoulder, so discretion with his experimentation was essential. It is also true that that a lockable cabinet would ensure that none of his children, on whom the empire was relying for its succession, could sneak in and be tempted to sample the Olio di Dippel. The dangers for an experimenter were real ones. Leopold's hobby of messing about with chemicals seems to have been inherited by his fourth son, Alexander Leopold (1772-1795), who made his own fireworks for a display at Laxenburg Palace near Vienna. He and his assistants were burned to death when, through his carelessness in the storage of gunpowder, they themselves became part of the display. In the same museum in which we can admire Leopold's cabinet we find a 'Table of Affinities' setting out the relationships of the substances known to the mid-18th century chemist (air is not one of them: it had yet to be discovered that it combined with other substances). 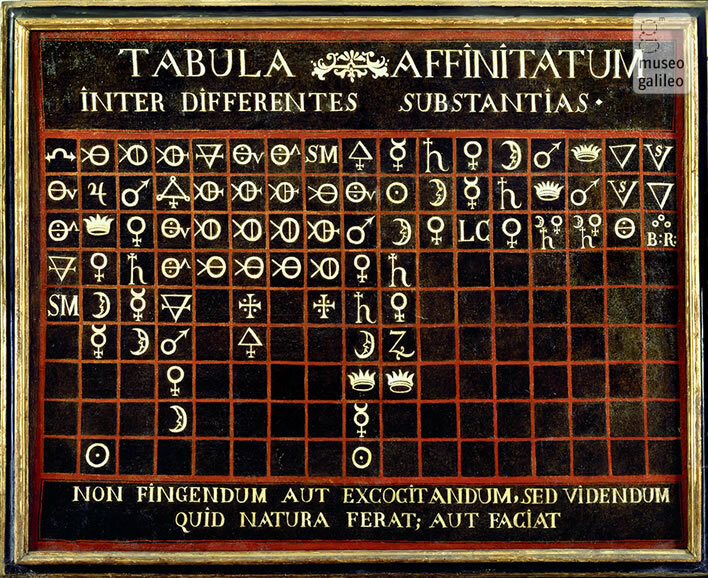 A table of chemical affinities between substances, commissioned around 1766 by the pharmacist Franz Huber Hoefer for the apothecary's shop of the Grand Duke of Florence. The table is modeled on Étienne-François Geoffroy's Table des differents Rapports observés entre differentes substances (Paris, 1718), from which it differs by adding a seventeenth column. The substances are identified by traditional alchemical symbols and the symbolic language in use in the seventeenth and early eighteenth centuries. Image©2010-2015 Museo Galileo - Institute and Museum of the History of Science. The table itself is interesting enough, but underneath it there is a brief Latin motto that sums up the spirit of the scientific revolution. The age of superstition, speculation, argument from authority and sophistry has passed. The spirit of the new age is: Non fingendum aut excogitandum sed videndum quid natura ferat aut faciat 'Not to invent and speculate but to see what nature bears and makes'. Why are we spending so much time on Leopold and his chemistry hobby? Because, as with so many of his other interests, Leopold is absolutely in step with the chemistry Zeitgeist. 1789: Lavoisier's chemistry textbook, which became the foundation of the science of chemistry. Leopold foresaw its meaning for trade and industry and the welfare of nations. It would be a useful science, a science that would take a major part in the huge strides in human well-being that would take place in the 19th century. Early physics and astronomy may have had the glamour, but it was the science of chemistry that brought so many immediate, practical benefits. Leopold was therefore quite in step with the scientific spirit of his times. However, most of us moderns would be taken aback by the way scientific investigation was carried out in the 18th century. This is because we live in an age when science is a profession and scientists are members of groups that, to the outsider, are as esoteric and hermetic as any mystic religion. They enjoy an almost unshakeable authority in the public mind: in public discussions that involve scientific propositions – such as that over Catastrophic Anthropogenic Global Warming (CAGW) – participants on the sceptic side are frequently accused of 'not being scientists' or as 'deniers' of the apparently incontrovertible results of 'science'. In the 18th century, in contrast, science had not yet been professionalised in this way. Getting involved in the empirical basis of science was attractive: anyone with time and money could mess about, carrying out experiments was fun and now even respectable. Many people with inquiring minds were dabbling more or less seriously, exploring their own little bit of the Great Machine. We can question whether this amateurish messing about really deserves to be called science, since many of the features that made science so successful such as the systematic documentation of experiments or the reliable dissemination of results were missing from much of this activity. To our modern minds, just leaving some scribbles on a sheet of paper in a drawer is not 'discovering' anything, no matter how right the scribbles may prove to be. Scientific knowledge does not exist until you tell everyone else about it. The process of professionalisation, initially the founding of learned societies that stimulated research and the sharing of information, had already started in the middle of the 17th century. The foundation of the Royal Society (1660) in London can be taken as a starting date. During the 18th century, encouraged by widespread public interest, the process speeded up. The foundation of the 'Lunar Society' in Birmingham in 1765 is a convenient marker. By the middle of the 19th century, fuelled by the immense progress of the new technologies, we find that activity we recognize as 'professional science' today. Even the great Isaac Newton (1642-1727) was bumbling along in most of his work in a way we would regard as completely unscientific. The interest that really stirred him was not mechanics or gravity, the source of his present fame, but alchemy. Of his extensive researches in this field he published nothing. The bitter dispute between the followers of Newton and those of Leibniz (1646-1716) about the discovery of calculus only arises because Newton did not publish his development in a timely and accessible way. Modern science moves forward in increments using the ratchet of relatively brief papers on extremely specific subjects. In contrast, Newton and the savants of his time were writing multi-volume tomes that took years to complete. 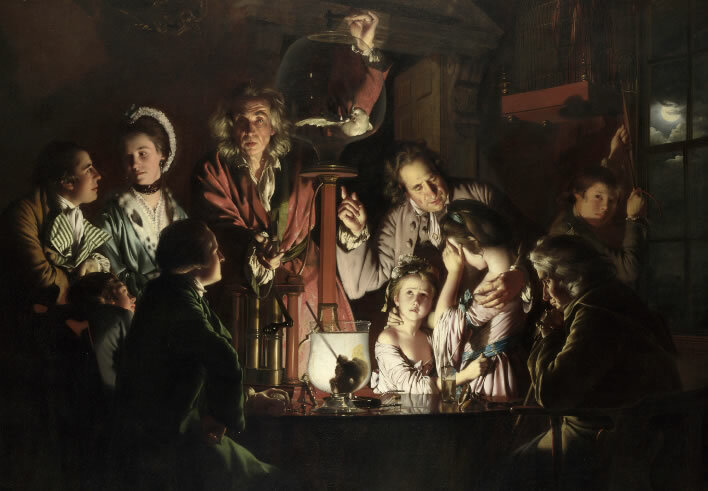 Just at the same time that Leopold was (probably) having his chemistry cabinet built for the purposes of his secret hobby, Joseph Wright of Derby (1734-1797) was creating his two masterpieces illustrating the new people's sport: A Philosopher Lecturing on the Orrery (1766) and An Experiment On A Bird In The Air Pump (1768). The latter is worth examination for the light it throws on the new craze for experimentation. Joseph Wright's An Experiment On A Bird In The Air Pump (1768), National Gallery, London. Experimentation was a people's sport, not an occupation for specialists. Here we have whole families taking part in the demonstrations. Wright, a master of light and shade, set both paintings at night, so heightening the dark mystery of the new age. This is not really an experiment - it leads to no new knowledge. It is simply a demonstration, the new spectator sport of the scientific revolution. The bird did not enjoy it. The 'scientist' is the conjuror. The painting is full of detail that highlights the ambiguous nature of scientific experiment. Not everyone is interested in the spectacle: the amorous couple standing on the left are clearly more interested in themselves than the demonstration that birds can neither fly nor live without air. The seated man in front of them holds a watch in his hand, presumably timing the duration of the bird's survival. The two children are appalled at what is being done to the bird in the name of science: their father(?) is comforting them and pointing upwards, the traditional iconography in paintings for a journey to heaven. Although not in the centre of the painting the two children are the most strongly illuminated figures. Their fear and shock at what is being done to the bird in the interest of the new experimentation is thus the principle message of the painting. The boy is raising the birdcage on its pulley. It will not be needed again this evening: the bird will be dead. A full moon – with all its connotations – can be seen through the small window. It may even be a reference to the 'Lunar Society' formed nearby in Birmingham in 1765, only a few years before this painting was made. On the table to the right we see a set of 'Magdeburg hemispheres', two copper hemispheres that when sealed together and evacuated are used to demonstrate the force of air pressure. This work was not painted in praise of scientific experimentation, quite the contrary. It exudes the demonic: the wizard-like master of ceremonies, the darkness, the sacrificial victim of the bird, the pointless killing of which in the interests of this scientific hocus-pocus is repellent. It is the innocent children, still in the natural state, whose reaction to the events is the correct one. The churchmen of an earlier age would have interpreted this as the dark works of the devil in the earthly night; the scientific mind would see the light of empirical reason illuminating the surrounding darkness. It is certain that in any previous century such abracadabra demonstrations would get you into serious trouble with the religious authorities, Protestant or Catholic. Witches were being burned for less. 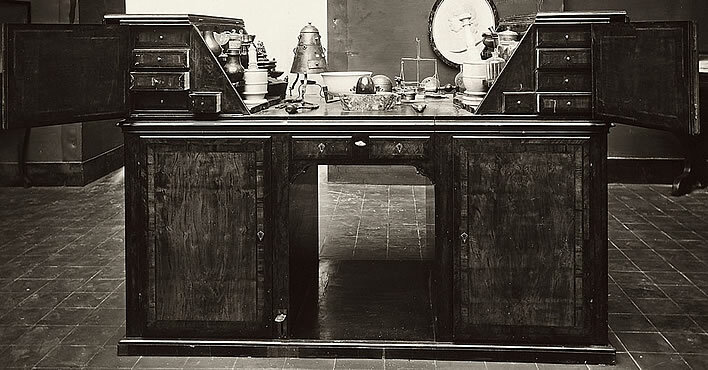 Open up Leopold's cabinet and you will find two candelabra that can be fixed to the shelves on either side of his worktop (shown in the image above). In the evening the 'visionary prince' would retreat to his cabinet, unfold its panels and in the flickering candlelight probe the secrets of the chemical world for the glory of Tuscany. From a window of the ducal palace in Florence a light would glimmer 'From the far tower where Milton’s platonist sat late'. If only Joseph Wright had been there to paint the scene. W.B. Yeats (1865–1939), Collected Poems (Macmillan, 1965), The Wild Swans at Coole (1919),	'The Phases of the Moon', p. 184.